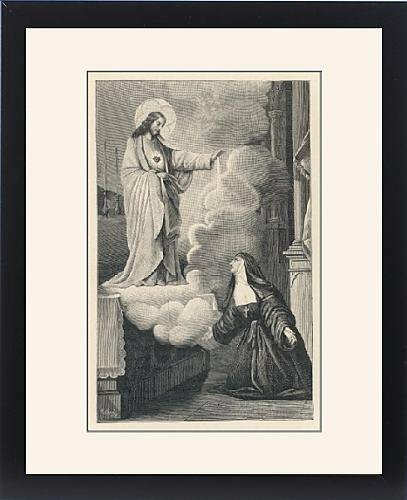 Framed Print Of Alacoque s Vision 1675 by Prints Prints Prints at UtopyaCon. MPN: s27_605185_6989_461. Hurry! Limited time offer. Offer valid only while supplies last. FRAMED PRINT. 22x18 inch (56x46cm) Framed Print with Black Satin with Off-White Digital Mat. Artwork depicting ALACOQUE S VISION 1675. FRAMED PRINT. 22x18 inch (56x46cm) Framed Print with Black Satin with Off-White Digital Mat. Artwork depicting ALACOQUE S VISION 1675. Marguerite-Marie Alacoque has her fourth (and last) vision of the Sacred Heart of Jesus, at Paray-le-Mondial, France this will lead to the Catholic cult of the Sacre Coeur. Shipping from USA. Artwork Description... Marguerite-Marie Alacoque has her fourth (and last) vision of the Sacred Heart of Jesus, at Paray-le-Mondial, France this will lead to the Catholic cult of the Sacre Coeur.